John Gilbert Winant OM (February 23, 1889 – November 3, 1947) was an American politician with the Republican party after a brief career as a teacher in Concord, New Hampshire. Winant was born on East Side, New York City, the son of Frederick and Jeanette Winant, his father a prosperous partner in a real estate company. John Winant held positions in New Hampshire, national, and international politics. He was the first man to serve more than a single two-year term as Governor of New Hampshire, winning election three times. 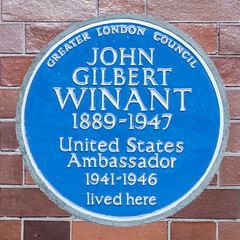 Winant also served as US Ambassador to the United Kingdom during most of World War II. Depressed by career disappointments, a failed marriage, and heavy debts, he committed suicide in 1947.